Operation smile for the birthday girl November 16, 2009), Clarissa of KIZUNA, who has been a great friend to everybody, online and offline... and continously making us smile with her sharings and thougtful messages. because life is full of surprises... CHEERS and cheer up! momsie email me po for details ng give aways para mapadala ko sau thanks. 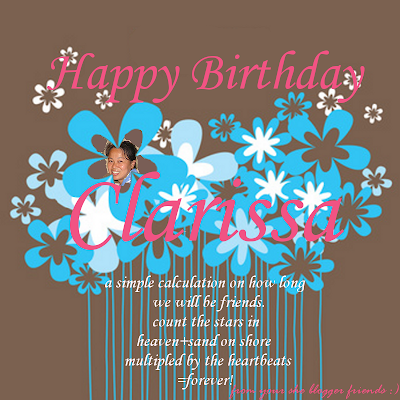 Happy Birthday to Clarissa. May you have many more blessed and abundant birthdays to come. Thanks for the post. God bless you all always. love the voice of your sissy's friend bams. galeng! and the avp for clang is a very good one too! a very beautiful bday gift! oh my golly gosh gosh..super bongga naman tong presentation mo dear...bravo! Happy, Happy Birthday. I hope this made you smile like that.